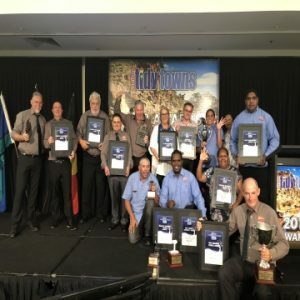 We are proud to announce that the MacDonnell Regional township of Santa Teresa (Ltyentye Apurte) has won the 2018 Northern Territory Tidiest Town accolade on the weekend in Darwin! Heimo Schober (Keep Australia Beautiful Council NT CEO) said Santa Teresa’s (Ltyentye Apurte) key stakeholder’s dedication and collaborative work to keeping their community tidy and beautiful has certainly made it a stand-out this year. As the Territory’s 2018 Tidiest Town, the central region community of Santa Teresa (Ltyentye Apurte) will represent the Northern Territory at the Keep Australia Beautiful, Australian Tidy Towns Awards in Tasmania next year. 2018 marks the 6th outright win for the MacDonnell Regional Council. The township of Santa Teresa has (Ltyentye Apurte) demonstrated great community collaboration, pride and leadership in local sustainability practices and education, and set a wonderful example for other remote townships to follow. The Territory Tidy Towns Awards program recognises and acknowledges the commitment, collaboration and hard work undertaken by remote and regional community key stakeholders, schools, individuals, stores, Rangers, Aboriginal Corporations, businesses and Councils.